One of the greatest struggles in parenthood is the appropriate and reasonable response to risk. There are a number of good reasons for this - our children are precious to us and we want to protect them against everything. People have a tendency to overestimate the likelihood of events that are rare but highly memorable such as an airplane crash, death from a rare disease or the kidnapping of a child by a stranger. People also tend to accept a much lower degree of risk for events that are out of their control than they do for things that are within their control 1. This results in the over-removal of possible hazards with a resulting loss of associated benefits and increase in other risks due to loss of skills. The answer to this is not to blithely throw your child skill-less into a world of fast cars and fires but to be more scientific in your risk assessments. Risk assessment is a systematic approach to hazard identification and control. It can help you identify what elements of an activity can cause injury and provide methods in which to make it safer. Your goal in a risk assessment is not to totally avoid a risk but rather to bring it down to a manageable level. 2. How severe the harm could be. Keep in mind that harms may occur immediately or make time to become apparent. What sort of harm could occur? We often consider only physical risks but psychological and social risks should also be considered. How severe is it? Could it cause death, serious injuries, illness or only minor injuries requiring first aid. What factors could influence the severity of the harm? How often is the task done? Does this make the harm more or less likely. How often is your child near the hazard? Has the even ever occurred before? How often? Rare- May happen only in exceptional circumstances. In order to be adequately assessed, these three factors need to be combined in order to consider whether it is necessary to use a control measure. The below graph from For the Science does a great job of illustrating the combined effect. The combined effect is used to determine what course of action you should make. 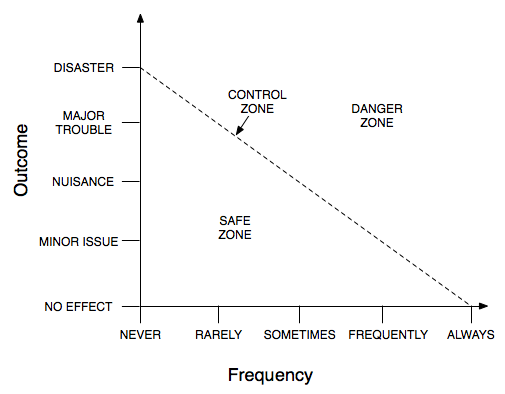 If the risk falls into the safe zone it can reasonably be ignored, if it is the control zone it should be kept under observation while an item with the danger zone will require some sort of action 3. 3. Work out a control measure. Your goal in a control measure is not to make the hazard completely risk free but to bring it into at least the control zone. The most effective measure is obviously totally eliminating the hazard and its associated risk. However many things that appear to be hazard, have benefits and may even reduce risk down the track. For example, a swimming pool has a real risk of drowning and you could avoid this risk by ensuring your child is never exposed to one (or any other large body of water), however this would prevent them from developing swimming skills, a lack of swimming skills could affect them socially throughout their life and could also place them in serious danger later in their life. A risks which has an associated benefit, should be dealt with via other safety measures to bring it to a reasonable level in relation to anticipated benefits. Providing personal protective equipment 4.